This book by the Polish author Celina Juda is about totalitarian culture and how it manifested itself in Bulgarian literature. Assoc. Prof. Celina Juda (The Jagiellonian University, Cracow) is a Bulgarian scholar, an author of two books: “Literature in Doubt. The Contemporary Macedonian Prose from the 60s of the 20th Century” (Kraków, 1992) and “Under the Sign of the People's Republic of Bulgaria (PRB). 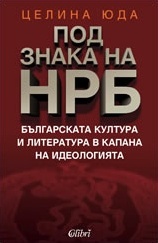 Bulgarian Literature and Culture into the Trap of Ideology” (Kraków, 2003). She has published over twenty studies in the field of the South Slavic theory of literature. Assoc. Prof. Celina Juda won the prize of the Ministry of Culture in Bulgaria (2001).